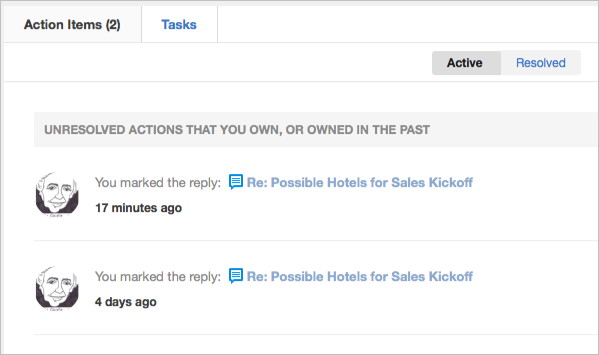 You can manage items that have been Marked for Action for you from the Actions area of the main interface. Click Actions from the main interface. From the Action Items > Active tab, you'll see a list of items awaiting Action from you. Resolve the item. Add a description of your resolution so that others know what you did that resolved the item. When you Resolve an item, it will be moved from the Active list to the Resolved list. From there, if you need to Unresolve the item for any reason, you can. Add more people to the item (Resolve > View Conversation > Add participants). Add other participants to this Action and leave them a note describing what you need. They can then Resolve or Take Ownership of the item. Go to the action item to review it in context by clicking on its title. Lets you review the full conversation. From there, click the Action Item badge and Resolve the item or Add Participants to bring in more people on this item.